I made this after seeing the post MAFE had done on his big sanding drum which I am unable to locate here in Canada so this is my alternative using my belt sander . 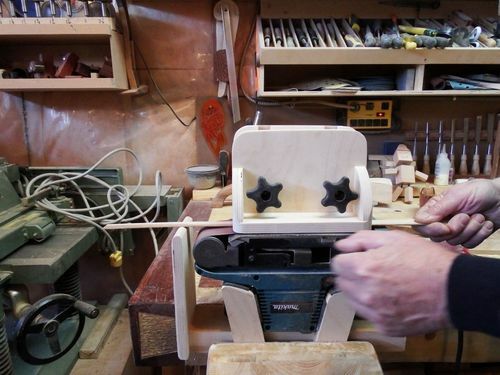 The attachment and cradle is made from Baltic birch plywood and is easily clamped to the bench or clamped in the vise making for easy set up. 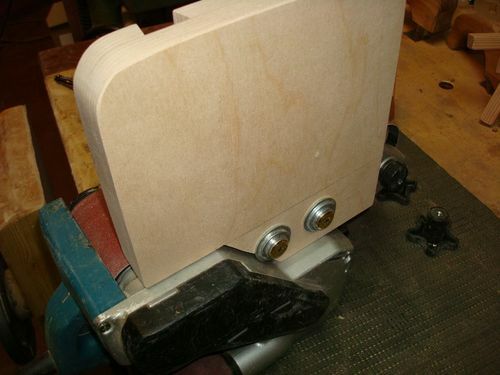 To set up the sanding operation I simply slide the sliding part of the attachment down onto the board to be sanded and lock up the sliding part with the two knobs and remove the board by pulling it out toward the rear of the sander. To start the sanding operation I start the sander and push the board into the rear of the sander and all the way through and pull it out the front .I may have to repeat this to get the desired finish and size . I attached a safety guard positioned on the front of the cradle to keep my hand away from the belt when pulling the board out of the sander . Here is some pictures that show and explain the details and the sanding process better then words . All the attachment parts . 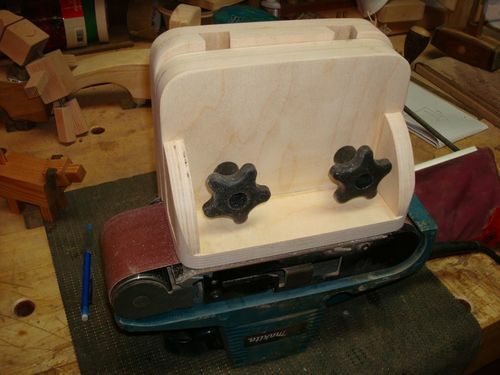 The attachment point on the sander and bolts . The sander complete with attachment and cradle clamped in my leg vise . The feed process motion ,push in and through and pull out with a good grip on the board at all times ! 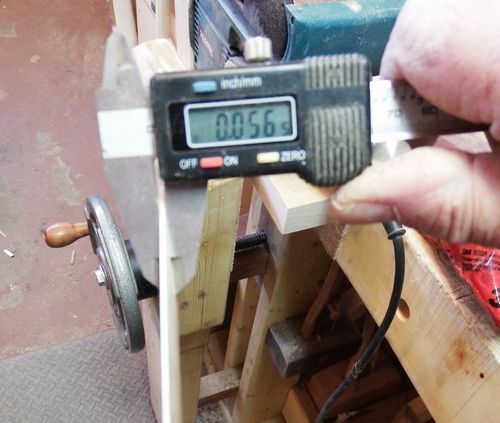 A strip of hickory one inch wide fed through the sander and the measurements on three points along its length are within one thousands ,not bad . 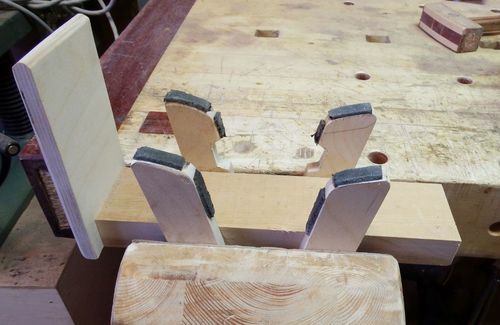 This attachment allows me to sand up to 5 3/4” wide by running the board one way and then reversing the board and run the other half since the attachment is open one one side . A 1/2” thick board being sanded and a 2” board is no problem . I can switch belts very easy from one grit to another and this will make sanding a lot more precise and quicker . That a neat idea. 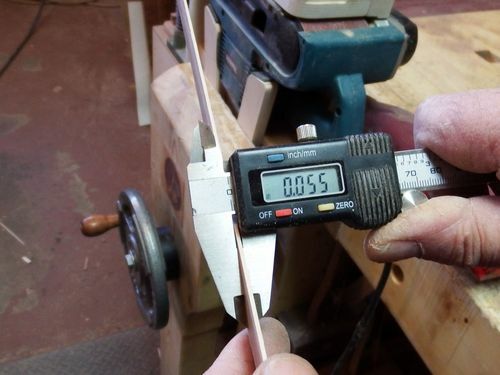 I had a real challenge when I was making tapered lamination with my thickness plane. 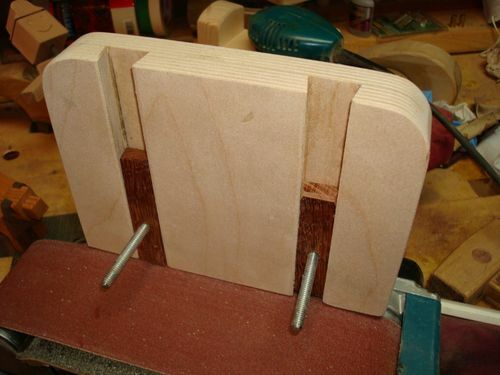 I don’t have a thickness sander and this would work since the width of the laminations are usually less than 3”. Thanks for sharing this idea. Now that’s a project that I really like. 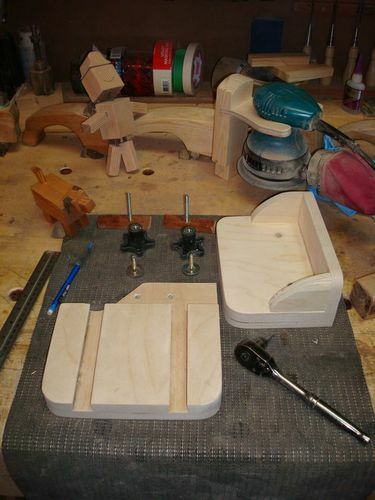 I’ve been thinking of building a thickness sander for smaller parts, but this really simplifies the process, has a much smaller footprint (the carry case when not in use), changing grits is a matter of seconds, and I would also have a hand held belt sander for other purposes. Love it! Thanks. How unique is this set up. Wow. 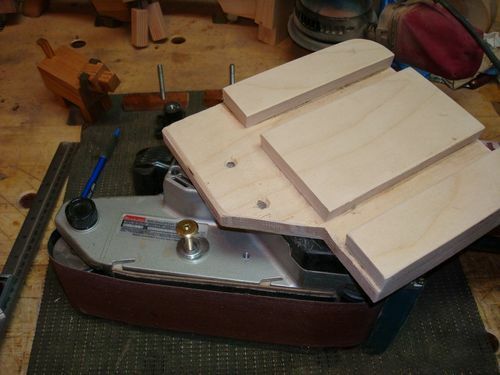 I remember years back my belt sander was used in many different positions for many different purposes. This would be very convenient and portable to have in any shop. If I didn’t have a drum sander, it would be on the list for sure. 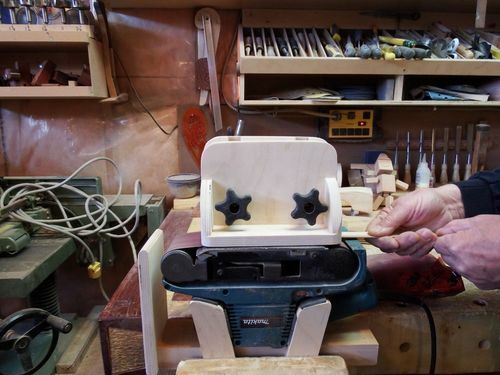 The sander cradle alone is cool. I will put this on the back burner for future reference. Thanks Klaus. 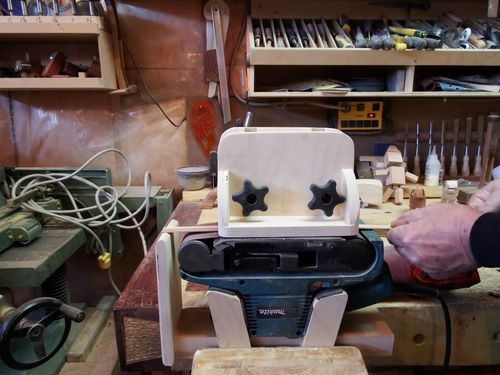 You need to submit that to Wood Magazine and win a nice tool prize. It is a sure winner. And you are a genius!!! Nice one Klaus. I love my thickness sanders. They can do things that no other tool can. For small jobs this is a great idea and will get lots of use I am sure. That’s brilliant, really love that and it is so easy to make. Love that you think out of the box or shall we say out of the drum. What about dust, can that little bag really take it? 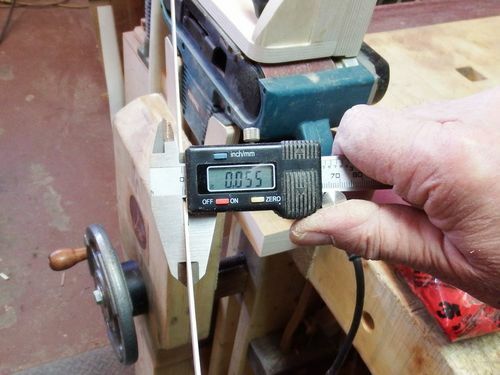 I totally agree with Andy (gfadvm) “submit that to Wood Magazine” Klaus, this is thinking way outside the box. You are one amazing man! My hat’s off to you sir! Do you need a safety on the feeding side? Nice idea and one that I had thought about too. 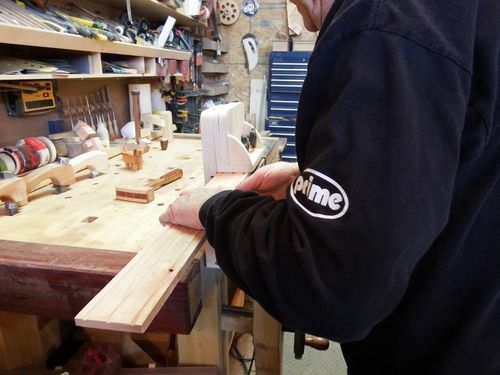 Question…...doesn’t the sander belt self-feed the piece of wood through? That was the bug in my thoughts on this…..that the sander belt is going so fast that it would just shoot the piece out the end too fast. Anyway, your design is certain to be copied by many…..even me! LOL. Great job. Just out of curiosity, what prevents the pieces from shooting across the bench should you’re grip slip? Innovative and well constructed—but what else do we expect from a Kiefer project? Thanks for sharing. Thanks all for taking a look and commenting . 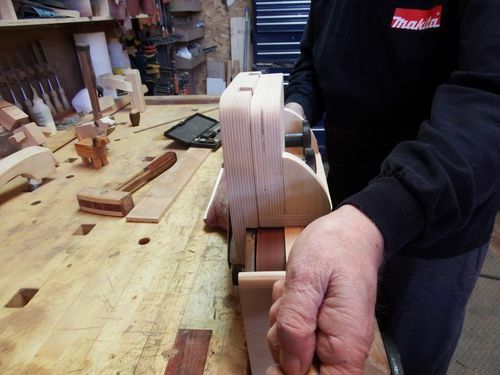 The board is fed into the sander from the back ( handle end/bag end of the sander ) against the rotation of the belt and I have to have a good grip on the board at all times or the board will eject from the sander and I also turn down the belt sander speed when doing this operation . I may also design a device into the attachment that will lock the board and keep it from going backward . Great idea and well constructed project. 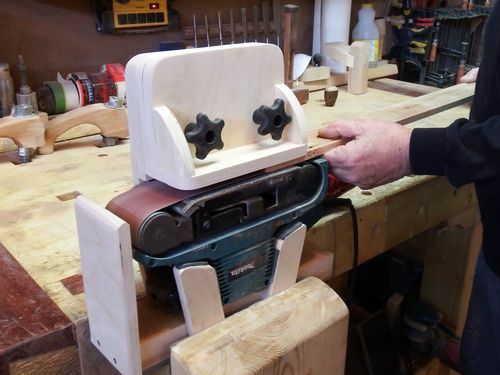 I seldom use my belt sander and I have a larger thickness sander but this would be very nice for smaller projects and much easier to change belts. Thanks for sharing! !